It’s been a while since any Organ Auction Live Events had happened, and today there are two of them swirling around. Firstly, it was probably several months ago when I first caught wind of the show happening tonight and tomorrow night in London, England. Not that I could have done anything about it in any case. 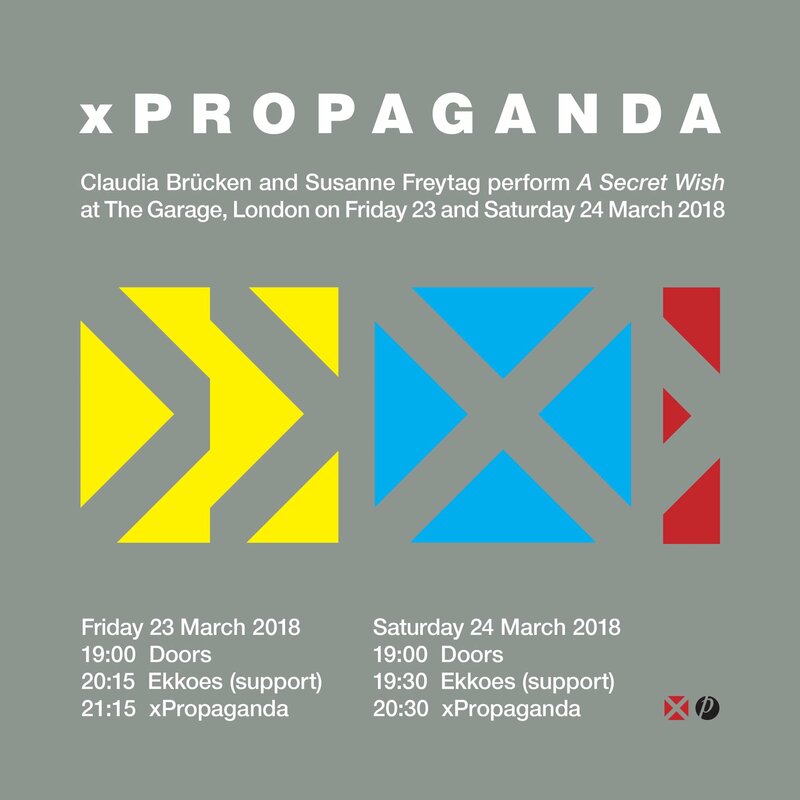 Claudia Brücken and her comrade in vocals and good friend Susanne Freytag will be performing the whole of Propaganda’s “A Secret Wish” on March 23rd and the 24th at The Garage in Islington. Needless to say, the initial show sold out almost immediately. A second date was added for tomorrow night as well. They have promoted the show under the name “xPropaganda,” which seemed fair to me though Michael Mertens took umbrage at the idea. Ms. Brücken had wanted to act [you saw that coming, right?] on the 30th anniversary of the album in 2015 but it just couldn’t happen that time. While it’s admirable to plan these big events on significant dates, the average Propaganda fan would want to attend such a show at any time in the last, oh… 32 or so years. Kudos to anyone who managed to get tickets to this one. And regular commenters attending? Please report back with your findings. For everyone else who would enjoy seeing Claudia and Susanne singing live, you’ll get more chances later on this year. p.s. Who else knew that jewelry maker and occasional vocalist Susanne Freytag had become a psychotherapist? “Not I,” says The Monk. 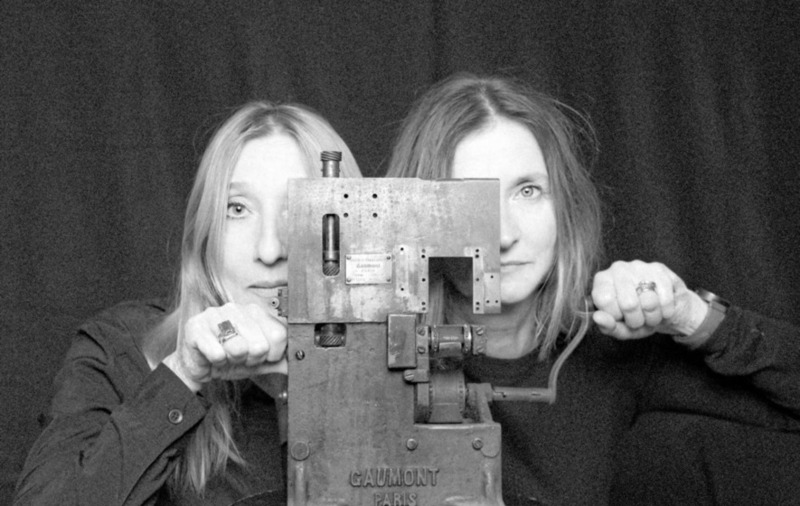 This entry was posted in Core Collection, Organ Auction Live Event and tagged 2018, Claudia Brücken, Propaganda, Susanne Fretyag. Bookmark the permalink. nick – Yeah, snagging Stephen Lipson to be your musical director is probably a one-time event. I get it. And protestations of the men aside, I’d go too, if it were not impossible. Ralf was at the “This Happened” concert in 2011 but for reasons unknown is not there tonight. I only knew earlier that Mr. Mertens had a bone of contention with this show. Will be there on Saturday! Amazing to hear they are also supporting H17 in Nov/Dec. SimonH – You have to report back!! I don’t have the opportunity to see xPropaganda this weekend, but I will be seeing OMD on Saturday. So, not sweating it too much. Brian – Let us know how the opener is. I think they are called GGOOLLDD. They pulled it off last night…lots of shiver down the spine moments. If only there were more songs! The sound was immaculate I hardly needed ear protection. I think they were quite touched by the genuinely rapturous response and clearly were enjoying themselves. Stephen Lipson was lead guitarist interestingly. SimonH – Hardly surprising as Lipton was guitar on the album. Immaculate sound, eh. Then you were a very lucky guy! So the show was just Propaganda from that era then. No other Brücken material? Any t-shirts that might show up in Claudia’s store afterward [crosses fingers]? I know this concert was on it’s way but I didn’t realise tickets were on sale so missed out. I was fuming and so angry with myself! Fortunately about 6 weeks ago they made 40 extra tickets available for each night and I was immediately alerted by a friend and managed to snag one. They played to a backing track, which the sound engineer or perhaps laptop operator, kept rather too low in the mix for the performance. So electronic bass, orchestral stabs and synth arpeggios didn’t really kick through.. Otherwise it was magical! Many tracks were extended to allow the live parts to breathe and there was a track in German that I hadn’t heard before, probably called “Discipline” which Suzanne vocalised over the top of “Abuse” backing track whilst wielding a horse whip! Kind of reminded me of “Der Amboss” by Visage.. I purchased the T-Shirt and a mug and met the ‘girls’ briefly for a signature to round off a perfect evening! Logan Sky – Welcome to the comments! I’m glad to hear a pro weigh in on the eternal “Live or Memorex” issue. I’ll never forget the lively conversation I had upon seeing Kraftwerk back in 1998 for the first time with my friend and commenter JT [who was a member of Pigface in addition to being a live sound engineer] musing on just what was being delivered. That they gave live parts room to breathe was encouraging. I’m all too aware that gigs now can simply be a vocalist jacking in a MacBook and singing [see: Molly Nilsson] and there’s nothing wrong with that. In fact, seeing her do that has a lot of integrity, but I’m sort of an old-fashioned music fan. When I see an act live, often it’s often the differences between the version on disc and what I’m hearing in concert that adds much of the interest. We all know everything can be run off of Logic or Ableton Live using samples from the master recording; but that’s not a compelling reason why it should be. At least to me. Nice that they left room for human input in what was some very machine-like music. So that’s interesting that they performed their early Throbbing Gristle cover of “Disziplin!” Who would have guessed? I recall when Andreas Thein released the early Propaganda demos on CD, but it was in 2002, a time when I was as broke as I’ve ever been, so I never had the pleasure. Just Secret Wish era, which of course left them a bit short time wise. We did get Duel twice plus Discipline and Femme Fatale in the encore. It felt right though to keep it like that, as nice as it would have been to have some Act etc…. Yes, there were t shirts, quite nice, I passed as small was sold out. Can you believe, there were also mugs?! Did pick up a nice used Japanese import of Rupert Hine’s third A&M album in a brief bit of record shopping earlier in the day. SimonH – I’d be interested to see if any L/XL show up in her webstore. I may have to partake. Nice to have gotten “The Wildest Wish To Fly” on CD! The JPN/UK/GER pressings on CD were all strangely equivalent over the years, making any one of them [I’m not picky] the “one to get.” I suppose if I ever saw one, I’d pounce, too.